Monolith - Das Chromaphon is an audiovisual tool for creating music. Visual representation and sound are directly linked together. The user paints on a rotating surface. 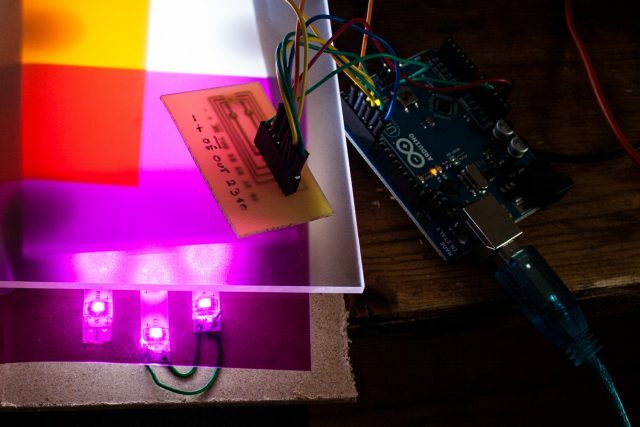 The colors are read by a sensor and translated into controlvoltages for an analog synthesizer. Monolith is my bachelorthesis at the University of applied Sciences Augsburg and was supervised by Prof. Robert Rose. Monolith – das Chromaphon works very smiliar to a regular turntable. Where the needle normally sits, i mount a colorsensor. Instead of vinyl discs, i rotate transparent, acrylic discs. The housing is completely built by myself and features a Faulhaber drive for turning the discs, as well as a backlight to make it easier to read colors and get a strong visual impact. You can adjust the turning speed of the discs in a wide range, and choose between different operating modes like a mode where color information is snapped to a pentatonic scale, or a mode where no clipping at all takes place. The front of Monolith has four 3,5mm mono jacks. These output color information in voltage. The more a colorcomponent is readable, the higher the voltage gets. For each component of color (red, green, blue) you get one output. The fourth jack is a gate signal, detecting white. When working with an analog synthesizer you can plug the color voltages wherever you want and control any parameter. This is interesting when creating huge, drone-like soundscapes, and turning the colored disc slowly als well as playing rythmic patterns. Monolith is at the end something like a sequencer which runs on colors. Because you can use any coloring material, raspberry syrup for example, the sounds can even change with every turn. The motor is strong enough to keep turning even when you start painting on the disk. Overall the setup is quite robust. Holding and pushing the discs (some call ist scratching – but there is no needle!) is no problem at all and gives interesing timing effects. A bright backlight let’s the colors shine intensely and attracts people to this exhibit. 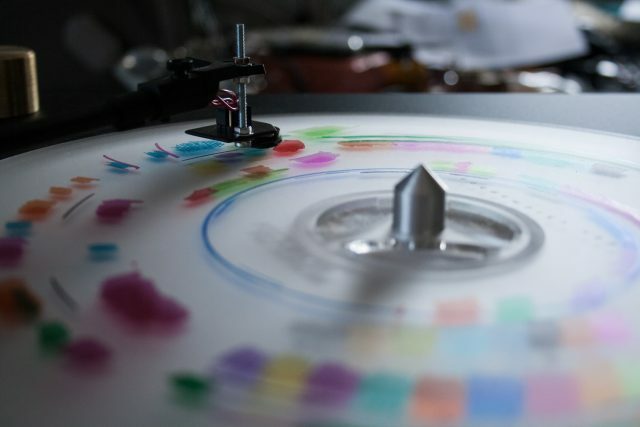 To show the link between color and sound, i record the turning discs from above with a camera and project the liveimage. So it is getting transparent what is happening beween sound and color. Monolith can also be a tool to explore synesthesia.